I'm writing you this letter knowing that you'll never read it. When I'm finished with these words, I'm going to roll the parchment up, slide it into a ceramic vial, and sink it in a swamp. That's what you do with prayers here, or at least prayers to Pharika, who seems to be the god of potions. She's also the god of poison, so maybe these words will just make things worse for me. I don't understand this plane yet—I've been too busy trying not to die. But I'm getting ahead of myself. I once told you where I got my sword—it's from a plane called Theros, and that's where I am. I had hazy memories from my first visit years ago—an old forest with massive, gnarled olive trees, and a dizzying precipice overlooking a rocky expanse. When I arrived this time, I ended up in a bleak swamp near an entrance to a cave. It was a stroke of good luck because the cave is a temple, and I was cared for by these snake-loving priests, who are cold but efficient. Luckily, the priests don't care where I came from, nor do they want any compensation for their aid. Today, they pushed this charcoal pencil into my hand. I know they want me to write prayers... but how can I when I don't understand the nature of the divine? Koth said he saw you a second time after Urborg, but he never told me the circumstances. I hope you didn't try to find me on Mirrodin, but at least you know some of what's happened. 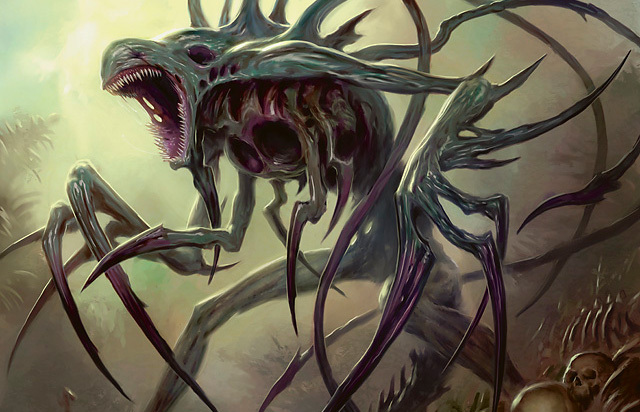 You know that Phyrexia reared up and engulfed the metal plane. 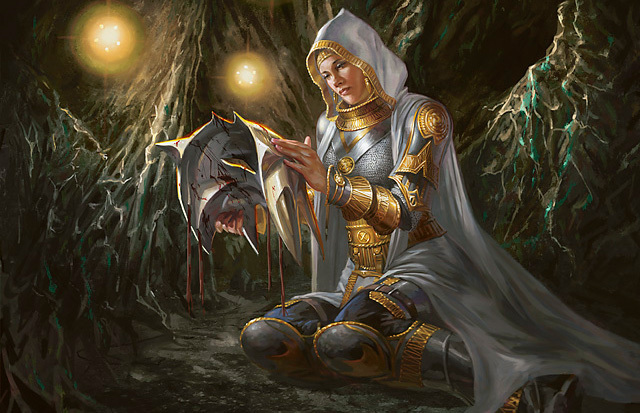 You know that a young Mirran named Melira provided us with a natural immunity to the Phyrexian contagion. You've wandered the planes more than me, so you probably understand the contagion more than I do. Koth is... was... a remarkable man. I don't know whether he lived. For all I know, he was killed in some brutally excruciating way. Since Koth is also immune to the contagion, they'll have to cut him up to make him submit. The Phyrexians specialize in dismemberment, and we promised each other we'd kill ourselves before they could take us apart limb from limb while we were still alive. But I wasn't there with him at the end, so I don't know for certain. If he's gone, I pray he died quickly. There was a brief time after Karn left that I thought the resistance had a chance. The praetors were squabbling among themselves for supremacy. But they all began to despise the interloper, Tezzeret. Although the resistance had limited access to information, we believed Elesh Norn had dominated Urabrask's and Sheoldreds' domains. So we focused our energies on destroying her. But for every life we saved, they slaughtered eight, ten, a hundred more. And soon there were precious few left to save. In the words of Elesh Norn, "We are a single entity. Dissenters must be sutured into the orthodoxy." Life on Mirrodin was a sickness beyond words, beyond comprehension. And yet we lived it. Day after day after day... until we could go no further. The resistance was lost. We reached the finale—the night of our final stand. We were separated from Melira and her keepers. I don't know if they were captured, but I don't see how they weren't. Koth and I managed to infiltrate their cathedral-fortress and navigate that warren of death and madness. We had to cross the Butcher Hall to reach the secret chamber, which had been used for "special" executions in the days of Karn. Now, it was empty except the dramatic pattern of dried blood dotting the ceiling, almost like stars in the night sky. The most important thing about the chamber was that it was beneath the new throne room, and Koth carried a spellbomb. The Mirrans have had spellbombs for ages, but no one had ever built one this powerful. We'd modified it using Venser's schematics. The idea was scrawled in that notebook of his along with his plans for Phyrexian-inspired ships that could drift between the planes. Don't hate me, but I'm glad he died before he could finish that ship. Ajani, I pray you never see Phyrexia. But imagine a white sheet with its corner dipped in bucket of blood. It's a law of nature that it will spread until there's nothing left except a seeping stain. That's Phyrexia. By that last night, everything had been marred by them. They'd consumed and necrotized until Koth and I were the last natural forms on that unnatural plane. At least that's the way it seemed to us. We'd learned that the praetors were gathering in the throne room to select a new Father—or Mother—of Machines. Tezzeret was supposed to be there, too. But if so, it was probably so the others could decapitate him or steal his body parts for some grand new construct. We didn't know if the praetors would ever be in such close proximity again. This was our last chance to do damage that they might actually feel. Still, I couldn't help but thinking: What is left on this world to save? I saw the praetors as the gods of New Phyrexia. I imagine that's how they thought of themselves. "Behold, perfection." 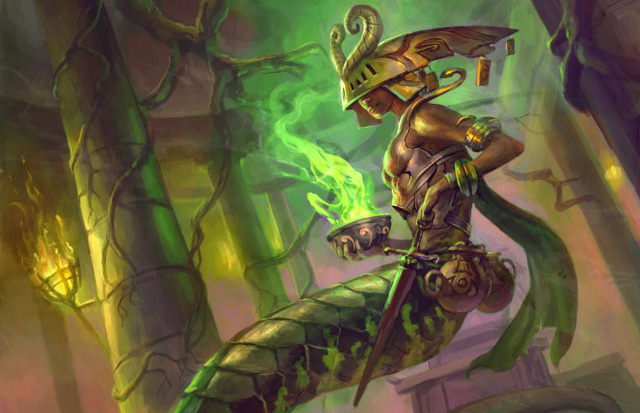 Even if we succeeded and we killed all the gods of New Phyrexia, it wouldn't bring an end to it. They don't need a mind to drive that genocide—it's inherent in the contagion itself. 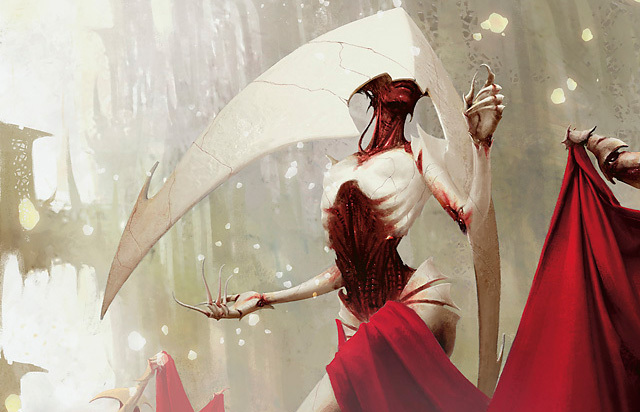 Elesh Norn, Sheoldred, Jin-Gitaxias—one head lost, another one grows in glorious perfection. And Phyrexia will spread, you know that as well as I do. You know what Koth says: "If there is no victory, then I will fight forever." But that night, I reached the edge of forever. Writing this makes me so tired, Ajani. I feel like shards of glass line my throat. I would go blind if only I could forget all that I've seen. Was I ready to die there, with Koth, to sacrifice myself for a greater good? He was willing. It was never a choice in his mind. Wherever he is, whatever he became, there is no doubt he is a better soul than me. The Phyrexians zeroed in us even though we'd sealed the door. It was just a matter of time before they broke the defenses that Koth had slapped into place. The clanging of the weapons against the wall was a cadence, counting the seconds until they were inside. I felt no glory, no desire for greatness. I'll tell you the truth—I just wanted it over. I wanted it done. I was wounded, starving, and burdened with the names of the dead from this world and others. Koth set the spellbomb. Have you noticed that time is a funny thing? Have you ever felt it slow to where the seconds feel like knives into your skin? It's the angel's truth, but I didn't understand what he was saying to me. I'd like to say that I protested: "No, no, I must stay and fight." Something like that. But I just stared at him, listening to the door bend to the intruders' single-minded determination to flay our skin from our still-living bodies. "You're leaving," he says again. "And there's nothing to come back for. Seal this world off, and throw away the key." And go where? "There is no home for me, Koth. Not after this." Not after everything. "You can find rest or you can find another battlefield," he says. "But not here." Did I ever tell you what Koth did to Venser? Back on Urborg, when he saw that Venser was building that Phyrexian ship? He encased his head in rock and coerced him to planeswalk to Mirrodin. Now it was my turn, but he just sunk me up to my knees in the stone and left me there. Like I was a sign post warning the world of its imminent demise. And then he raised a wall between us to keep the spell bomb from blowing me to shreds. That's Koth for you. He'll present you a simple choice, as if that made it easy. Leave or die. I know you'd tell me to forgive him. He was trying to save my life, which I had no interest in saving myself. But I hate him for locking me inside a cage with a door controlled by other hands than mine. A door with every nightmare I've ever had slobbering on the other side. I've never been fast at planeswalking. Once, you told me that it would get easier and hurt less. But it still feels like I have to use a metaphysical knife to shred my skin in preparation for the Blind Eternities. With my legs immobilized, I readied myself. But to leave, I had to bond with that fetid, violent mockery of a civilization. Before I could find the strength, the door exploded in its frame. I was still seconds away from being gone. An Obliterator lurched into the chamber. This is a brainchild of the contagion—an abomination designed solely to kill. And under that twisted vision, these creatures are perfect at what they do. It came at me with rows of teeth ripped from the mouths of living beings. Multiple blade-like arms shredded the air while noxious fumes leaked out of its chest cavities. It wore the skin of the dead and carried a legacy of crushed and broken lives. It only took a single step, and it was on me. I didn't even raise my sword before two of its blades drove deep into my belly. I reeled back and fell to the floor with my lower legs still encased in stone. The ground rumbled beneath my back as Koth's spellbomb exploded on the other side of his makeshift wall, but I don't know the fruits of its destruction. Above me on the ceiling, I saw the strange constellations, the pattern born of violence and degradation. The Obliterator loomed above me, its blade plummeting toward my head, and blocked the ceiling from view. So I closed my eyes, and in the darkness of my mind, the constellations transformed into the night sky of Theros. I remembered Heliod, the god of the sun. I saw him the day I got my sword. His form dominated the horizon. He was like a man, but with the essence of stars. 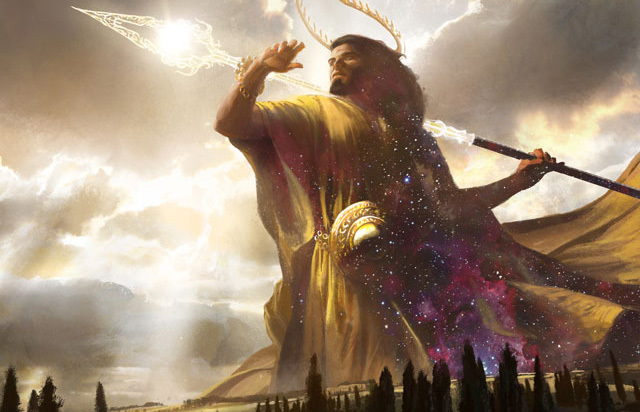 I desperately wanted to be on Theros, in the arms of the only plane where I'd ever seen the face of god. My blood rushed out of me as I left that nightmare world. In that strange blur and chaos of the Blind Eternities, I thought about the divine. 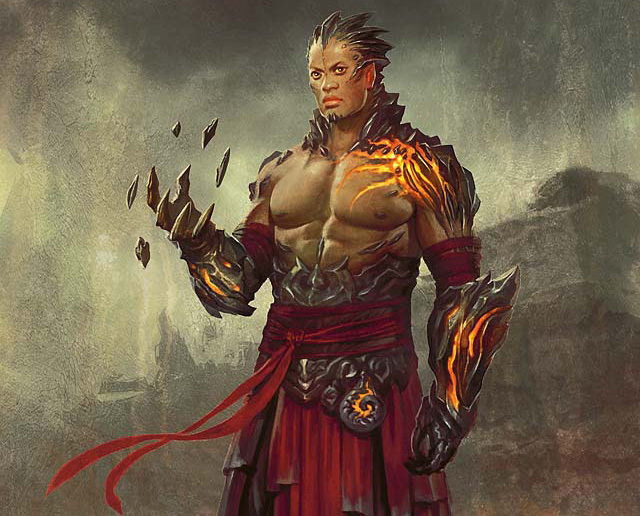 Maybe there is something about the gods that will make Theros indestructible. Maybe the divine presence means it can't be destroyed or infected. Maybe, if there are gods, then everything can't fall apart. I must discover what the gods are and what they want. Do they desire sacrifice? Loyalty? Honor? Until I heal, I am in limbo in this sacred cave where life and death seem to co-exist in some strange harmony. From where I lay, I can see the blue sky of my new world through the narrow rift in the rock. There's nothing to bar my exit. As soon as I am able, I can walk out and be reborn. I am resolved to stay here until I understand the nature of the world and its divine stewards. If you were here, Ajani, what would you tell me to do? Should I scream Heliod's name to the heavens? Or am I allowed to speak his name at all? Should I make a sacrifice? My sword is the only thing of value I have that a god might covet. How about this prayer: Please let there be something greater than me. Greater than the relentless evil that seems to devour every place where I lay my head. Please take away the pain and loneliness and memories I no longer want. Here's what I would say to Heliod, if I ever see his face: Give me quiet. Give me peace. Give me rest at last. So there you have it, Ajani. If you ever hear my story, will you judge me? Will you call me a coward for leaving, yet again? Maybe others would, but not you. When you look at me, you see all that I could be. When I look at myself, I see only what I should have been.